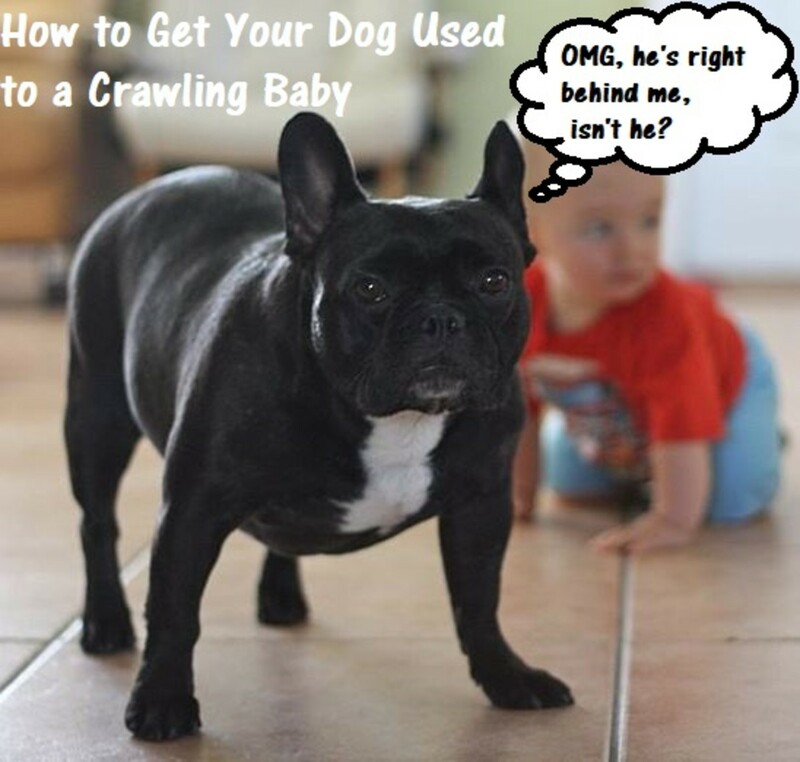 You may have never expected to be searching for ways to get your dog used to a crawling baby, yet it just happened: right when you thought you got your dog used to being around your baby, got your dog used to hearing your baby cry, giggle and make new vocalizations such as gurgles, oohs, and aahs, your dog's behavior showed yet another unexpected facet the moment your baby started becoming more and more mobile. Let's face it: unless your dog was used to being around crawling babies for a good part of his life, nobody ever told him that babies would get on their four legs and start walking around like dogs, cats and other critters your dog sees from the yard. Last thing he knew, humans were bipeds, and as such, were always walking on two legs. So let's imagine his surprise that day you put your baby down on the floor and your dog makes this abrupt discovery. Not mention the fact that babies can sometimes even crawl in odd ways. Yes, babies have quite a surprising repertoire of crawling styles! You have the almost prehistoric-looking belly creepers, babies who haven't mastered yet the art of crawling and engage in this odd, crawling on their tummies without getting up on their hands and knees.You then have the bear crawlers, basically babies who crawl on all fours but keep their arms and legs unbent, then you have the crab crawlers, where babies pushe with the arms and pull, and then you have the leapfrog crawlers where babies form a bridge with the arms and legs and thrust forward. How odd are these forms of crawling, that even mommies find them strange! Of course, Rover is terribly confused by all of this. "Is it a frog? A bear? A crab? What's going on?" His reaction may range from a head tilt, to whining, to more worrisome behaviors such as a fixated stare or even growling and barking any time the baby is on all-fours. If you notice nervous or aggressive or aroused behaviors, stop reading now and play it safe and keep dog and baby separated. The best next step would then entail consulting with a dog behavior professional such as a veterinary behaviorist or a certified applied animal behaviorist for safety and correct implementation of a behavior modification program (when feasible). Time to Erect a Baby Gate! If your appears nervous or confused, it's best to play it safe. Close supervision can seem to be a good option, but it's often forgotten how things can deteriorate quickly. Surprisingly, many dog and child bite incidents occur when the adult is there supervising. Your best option for peace of mind if your dog seems uneasy about the whole situation, is to erect a safe baby gate. This creates an ideal compromise so that your baby is free to explore at her heart's content and you can focus on supervising her as she ventures through all the nooks and crannies of the big, big world around her without you worrying about Rover. Your dog on the other hand, will likely emit a sigh of relief. He can still hear and likely see the baby from a distance, but this time he doesn't need to feel overly concerned about the baby getting too close to him or to areas he may feel a bit protective about (sleeping areas, kitchen). Erecting a baby gate also prevents your dog from rehearsing potentially troublesome behaviors. Practice makes perfect, as the saying goes. If you allow your dog to engage in distance-increasing behaviors such as stiffening, piloerection, growling when the baby is around, these behaviors may become more and more established up to the point of turning into a default way of dealing with the situation. The more these behaviors become established, the more they repeat and become stronger and therefore more and more difficult to eradicate. Providing your dog with an opportunity to feel a bit more relaxed is the ideal setup, especially in the early stages of your baby's crawling. It also allows your dog an opportunity to process this new element in his life. Management at this stage can therefore help your dog get used to seeing your baby crawl from across the gate but without feeling overwhelmingly concerned which may pave the path towards some early habituation. 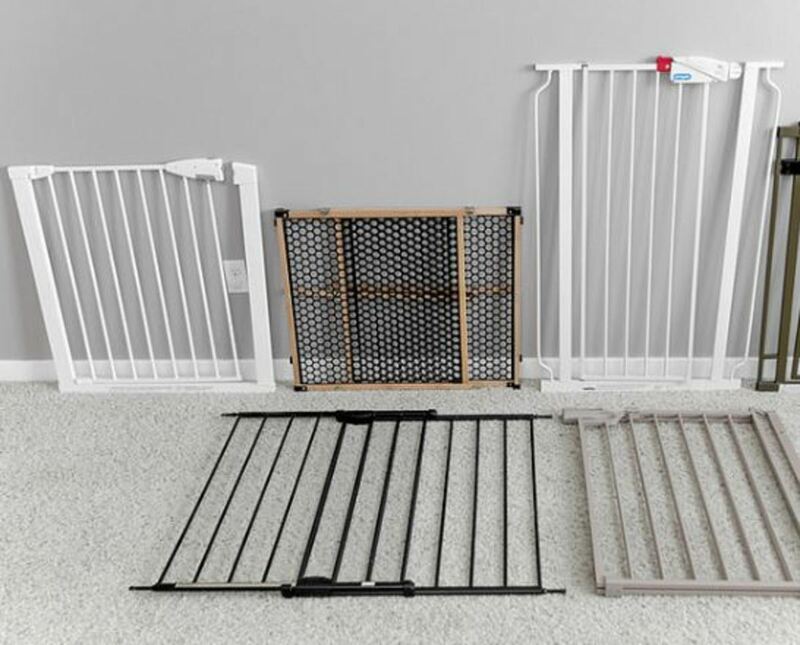 To play it extra safe, make sure the baby gate you erect is sturdy and cannot be easily knocked down by your dog leaning against it or jumping on it. Also, it never hurts to err on the side of caution and add a wire mesh panel to prevent your baby from sticking fingers through the baby gate should you ever get distracted for even a few seconds. If your dog has never really shown aggressive or overly aroused tendencies towards your baby but simply seems a bit confused by your baby's crawling, a time may come when you think it might be worthy to give Rover's behavior a shot and see if he's able to cope well with the situation. In such cases, it's important to supervise, but you want to add some extra precautions to active supervision. For instance, have an extra set of eyes with you to monitor the situation. With another person in the same room with you (like your spouse, relative or friend), you up your chances for not missing something and it's easier stepping in with the person redirecting your dog, while you quickly pick up your baby. Of course, such period of supervision must be of the active type, not the passive type where you chit-chat and observe with your peripheral vision or look away repeatedly for brief times. Eyes should always be on the child and dog. You can be actively monitoring your child as you stick closeby in ready reach (even better hold onto your baby as she crawls), while your helper is near your dog watching every move and reading his body language. Initially, it's a good idea to have your helper keep your dog on leash at a distance from the baby so to observe the dog's behavior and see if he's able to relax or at least not act over worried about the situation. Gradually, distance can be decreased, but never in reach of the baby. Only after several trials (and training some foundation exercises detailed below), it may be possible to move on to active supervision with the dog off leash. When off leash, your dog should always be wearing a collar so that he/she can be easily redirected and moved away as needed. It helps to get your dog used to collar grabs in advance. Therefore this is foundation work you should be doing beforehand. Read on further down for some foundational exercises to add an extra layer of protection. Some dog owners prefer to have the dog wear a leash tab, which is a sort of mini-leash that stays attached to the collar and is short enough that they dog doesn't get tangled on it. Instead of grabbing the collar, dog owners can use the leash tab to redirect their dogs to another area. On top of active monitoring and plans on how to redirect your dog as needed, it helps to ensure your dog is provided with escape routes. Many dogs who aren't comfortable in a situation prefer to leave rather than react, so make sure the room is large enough so that your dog can make good choices and move away if the child is approaching. Never let your baby move towards your dog in a way that your dog is cornered and moving away is no longer an option. This deserves needs a mental note: if your dog is moving away too often, then it signals that he's not comfortable and therefore you will need to work on changing those emotions (read below for some suggestions on how to accomplish that). On the other hand, some dogs do not realize that moving away is even an option. These dogs may become defensive when cornered rather than move away. Prevent this from happening in the first place and if your dog ever shows this tendency, promptly seek the help of a professional. Dogs and cats are particularly vulnerable to negative interactions when children start to crawl or stand. Children often see the dog and move toward it, perhaps even cornering the pet; a warning bite is the only communication the animal has left to make the child retreat. Children of this age should never be left unsupervised around pets. Before exposing your dog to closer interactions, it helps to train some foundation exercises and make them very fluent, so fluent that your dog responds to you almost reflexively. Following are some helpful foundational exercises and other training cues that you may use to redirect your dog as needed. Use these to redirect your dog and before your dog has even a chance of getting stressed. Train your dog to respond to a smacking sound with your mouth. To train this, in a quiet room with little distractions, make a smacking, kissy sound with your mouth and hand-feed a treat. Repeat this several times, like 10-12 times until your notice that your dog has made the connection that, every time he hears the sound, a treat is given. If upon hearing the sound your dog looks at you or looks at your hand expecting the treat, you know the association was made. Now, add some some distance. Stop making the kissy sound followed by giving the treat. Your dog should move away and look for something else to do. The moment your dog walks away, make your kissy sound. Your dog should walk towards you to get the treat. Praise as he moves towards you, and deliver the treat. Increase distance gradually, until you are able to get him rushing towards you from even across the room. Now, add some distractions. Practice this exercise when you have guests or when your spouse comes home from work and your dog is excited. Then make things more challenging, practice having your dog respond to your kissy sound when the mailman is delivering the mail or your dog sees another dog or sees some squirrels. 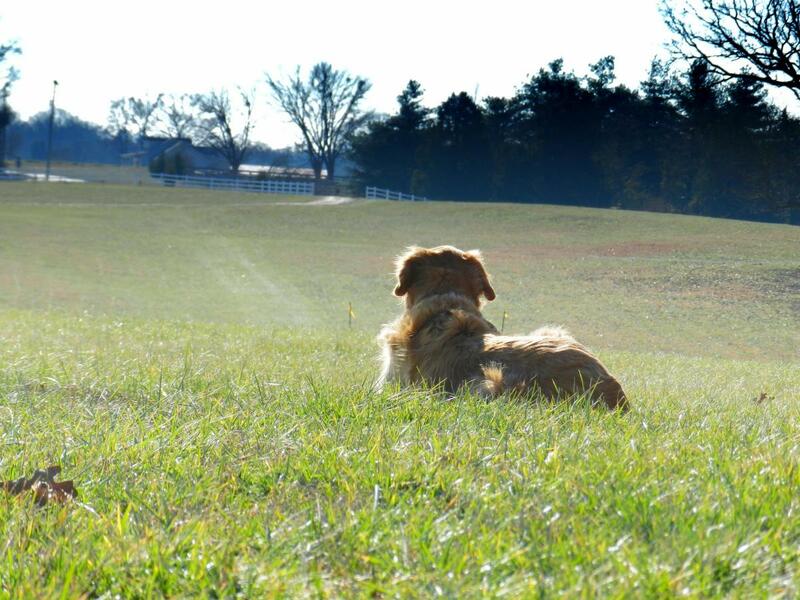 If your dog is too distracted to respond, you have progressed to a level of difficulty he wasn't ready yet for. You may also have to increase the value of the treats delivered if your dog is still too distracted and he is exposed to stimuli that overstimulate him. 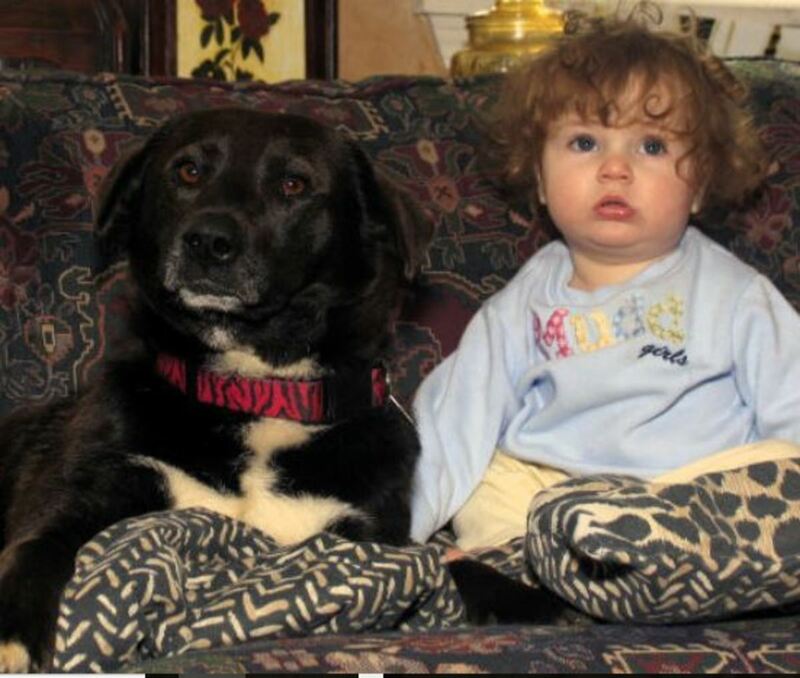 Once your dog is very responsive, practice in presence of the baby. Have your dog safely leashed and watch your baby crawl from a distance. Practice re-directing him to you with your kissy sound followed by a treat, when he seems focused on the baby. Once your dog is calmer, you can then progress and allow closer encounters but never in reach of your baby. You should be still able to redirect your dog to you for his treat when you want to get his attention. Consult with a behavior professional t play it safe if your dog ever seems too focused on the baby crawling, fails to respond to your kissy sound or shows signs of nervousness or aggression. You need to seek help as well if your dog is prone to resource guarding people, food, toys, eating and sleeping areas or other resources from the baby. Note: redirecting your dog by getting him to rush towards you upon hearing the kissy sound is preferable than removing the baby the moment your dog seems a bit uncomfortable. If you remove the baby every time your dog seems uncomfortable, (like when he growls or whines) you may risk reinforcing your dog's aggressive behavior. 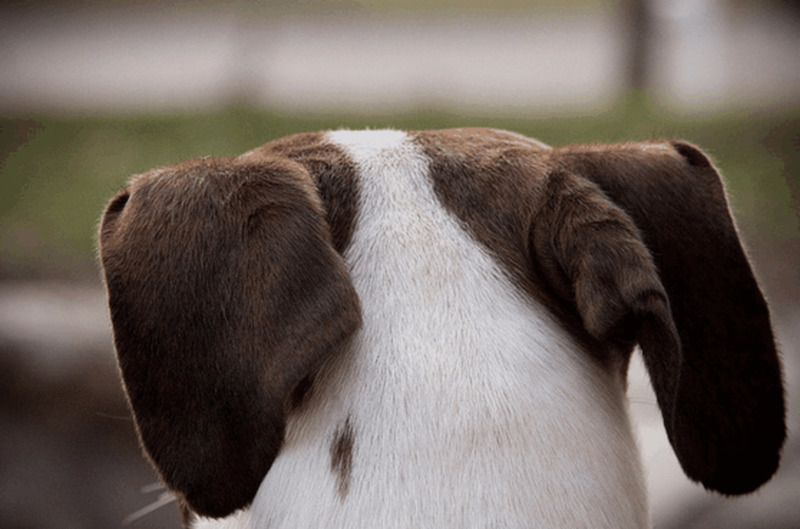 Not all dogs like to be grabbed by the collar and statistics even prove us that considering that several dogs deliver a re-directed bite after being grabbed by the collar. Indeed, according to Dog Star Daily, a good 20 percent of dog bites takes place when an owner is attempting to grab a dog by the scruff or collar. 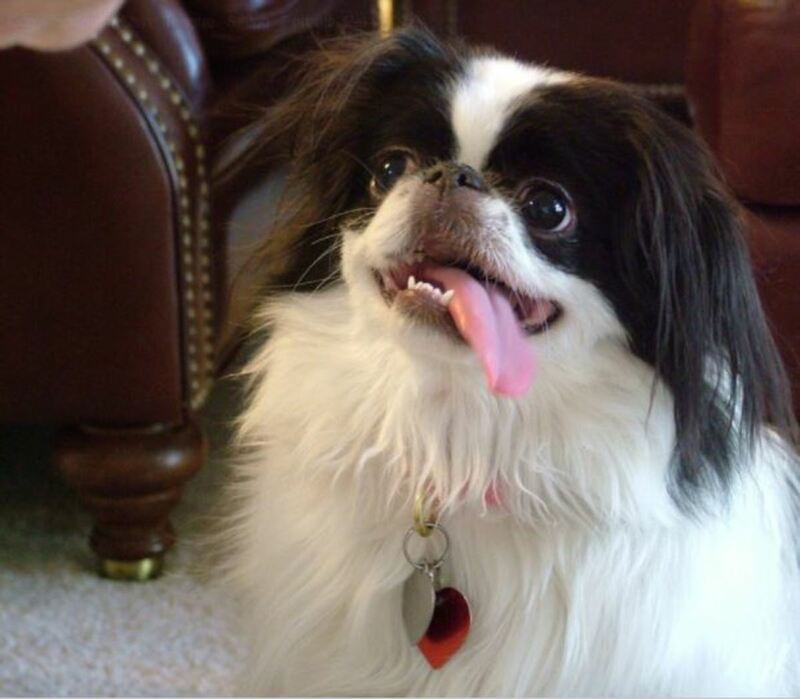 Even if your dog doesn't seem to react when you grab the collar, consider doing this exercise as preventive work because you may find yourself grabbing the collar quickly on several occasions in emergency situations (eg your dog is about to bolt out of the open door or is about to grab a piece of food your child has dropped from the table). Dogs who dislike being grabbed by the collar may often swerve when you attempt to catch them. It's important to prevent this from happening and the goal of this exercise is teaching your dog that great things happen every time your dog's collar is touched. Equip yourself with high-value treats and call your dog to you and touch the collar with one hand while with the other hand you hand-feed your dog a treat. The moment your dog is done eating the treat, remove your hand from the collar. Repeat several times, until, upon touching the collar, your dog looks at you for treats. Next, call your dog to you, put your fingers under the collar, hand feed a treat with your other hand, and release the collar once your dog finishes the treat. Repeat several times. Finally progress more and add movement. At random times of the day, grab the collar, hold on to it and then gently guide your dog to another area as you feed him treats. Graduate, by grabbing the collar, and gently guiding your dog to another closeby area and then only once in that area you feed him the treats and let go once he's done. At some point, you should have a dog who looks forward to collar grabs rather than dreading them or swerving away, which makes it tremendously helpful in case of an emergency. A word of caution: now that your dog doesn't mind being grabbed by the collar or even looks forward to it, it's your job to protect your hard work. Never touch the collar and make something negative happen. Never grab the collar and then scold your dog, or grab the collar to forcibly pull him inside a crate or other area, and never grab the collar and then let your dog do something he doesn't like such as being given a bath or clipping his nails (if he dreads these activities). If you need to grab your dog by the collar to put him in another room or in the crate, make sure to provide him with some tasty treats or a stuffed Kong or chew toy so that he doesn't associate the collar grab with being placed in isolation which csn feel like punishment to social dogs. Another great exercise that can help you redirect your dog as needed is to teach him hand targeting. To train this exercise, simply present your open hand to your dog, and the moment your dog sniffs your hand say "yes!" and give him a treat. If your dog is reluctant to sniff your hand at first, it's OK to smear a bit of peanut butter, canned food or cream cheese the very first times. At some point though, stop smearing your hand with these goodies. Your dog should still sniff your hand. When he does, be ready to say "yes" and give him a treat. Repeat this exercise several times, until your dog's behavior of targeting your hand with his nose becomes more and more fluent. At some point, when your dog targets your hand several times in a row, you can add the verbal cue "target." Simply say "target," present your hand, and the moment your dog sniffs your hand say "yes!" and give him a treat. Repeat several times until your dog understands that, when you say target you are telling him to come to you and make nose contact with your hand. As with other training exercises, you must then add distance and distractions to help the behavior become more and more fluent. Other foundation exercises you may find helpful in redirecting your dog is coming to you when called, teaching your dog to go to his mat and training your dog to lie down and stay even from a distance. Did you know? Pamela Reid in her book 'Dog Insight' suggests getting your dog used to crawling even before your baby crawls. She suggests crawling up to your dog and giving him cuddles and treats. Once comfortable with this, you can then progress by crawling up to your dog with your baby on your back (supported by your partner) and do the same thing. Dogs who have a harder time accepting the baby's crawling, may need the intervention of a behavior professional for safety and correct implementation of behavior modification. For mild cases though, where there is no aggression involved, you can help your dog cope with the situation by changing his emotional response to the crawling baby. A great way to do this is through desensitization and counterconditioning. An example would be, keeping your dog on leash at a distance and feeding your dog tasty treats, every time he sees the baby crawling on all fours. 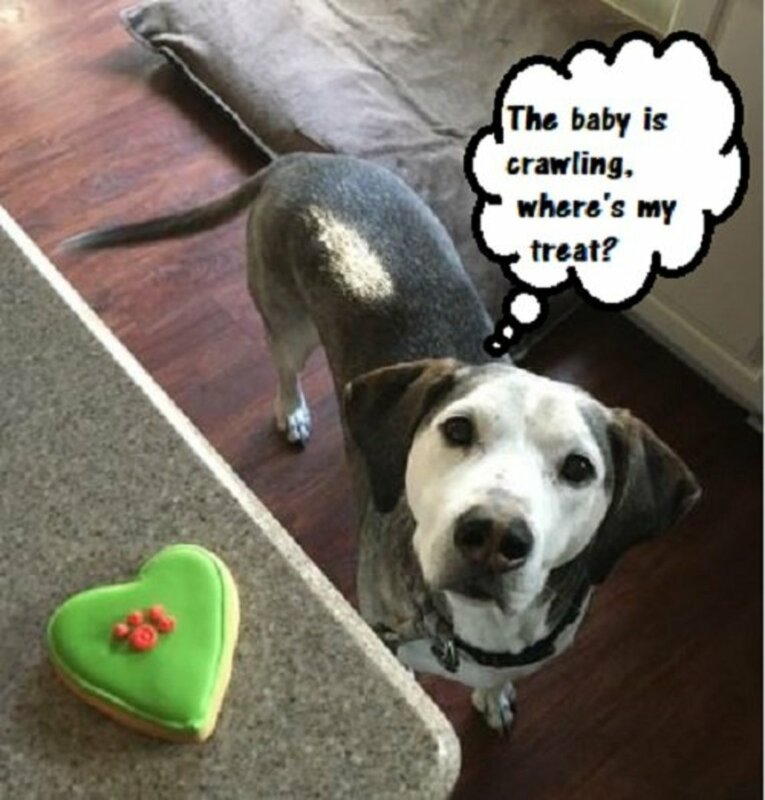 It's very important that the treats are given exclusively when the baby crawls if this is exactly what your dog is having problems with. This is a good way to clearly communicate to the dog that treats happen only when the baby crawls. The treats are therefore exclusively contingent upon the crawling.When the baby is doing other things, no treats are given. You may have to do this exercise several times a day and for several days to change your dog's emotions. At some, point, if this exercise is implemented correctly, you should start seeing a change in your dog's body language. You dog should appear more relaxed and sometimes, you may even notice some anticipation. It's as if your dog is thinking, "the baby is crawling, where's my treat?" You can then start gradually decreasing distance with your dog still on leash, but it's important to never go too fast or you may have a setback in the progress you have made so far. Make sure you protect your progress by not exposing your dog to situations he's not ready for yet. As your dog gets better, you can have an adult nearby the crawling baby (so to be ready to swiftly pick the baby up in case of an emergency) while you give your dog a bit more freedom by keeping your dog on a long line (long leash). You can now practice the kissy sound every now and then so that your dog can come to you fast and still make positive associations with the baby. After lots of rehearsals, you can then determine whether you can try off leash (but with your dog wearing a leash tab and you must always have a helper with the baby) while practicing active supervision. A word of caution though is needed here: just because your dog is more relaxed with having the baby crawling doesn't mean he'll be fine when your baby crawls and possibly does other things such as touches your dog or makes odd vocalizations as he/she approaches your dog. Never let your guard down. When dog owners relax too much is when accidents happen. If your dog ever appears nervous or aggressive, or your dog has given you reason to not trust him around the baby at any time, for safety it's imperative to seek the help of a veterinary behaviorist or certified applied animal behaviorist for an in-person consultation and assessment. Disclaimer: this article is not meant to be used as a substitute for professional behavior advice. There are always chances of accidents even amongst dogs with no history of biting. If your dog is aggressive or nervous around the baby, you should consult with a professional for safety and correct implementation of behavior modification when feasible. By providing positive experiences for the dog (play, feeding, attention) when the child is present, and minimizing these interactions when the child is not, we help the dog learn that good things happen when the child is around. This article is not to be used as a substitute for professional behavioral advice. If your dog is overly stressed or has shown aggressive or predatory behavior, please consult with a veterinary behaviorist at your earliest convenience. Suhail, I think I know what videos you are referring to. They are often shared on Youtube and go viral and then are presented by dog trainers under the "things you should never do" when you have dogs and children. Sadly, many people post them to show off the tolerance levels of their dogs, when we can see they are sending stress signals left and right. Thanks Galaxy Harvey, if the dog is acting aggressive towards the child, for safety purposes please have your friend consult with a behavior professional. A very useful article, thanks for posting this. I have forwarded this to my friend who is having terrible trouble with her dog and her grandson. I am sure it will help her. Bellatheball, it would have been insightful knowing exactly what you find off base. I wrote this article after reading some appalling articles that suggesting things like punishing dogs for growling at babies or even doing an alpha roll on the dog. Some others just suggested evaluating how the dog reacts by supervising. Not good. It's a fact that many incidents to children happen in the presence of parents "supervising." I have gone a step forward and added several tips that add an extra layer of protection. I also used veterinary behaviorists for references. I see from your history that you have different views on many articles authors post here. Makes me wonder why don't you write some articles here since it seems like you are so experienced on so many topics? I am sure you have a lot of knowledge to share. Thank you for excellent education for the dog owners and infants at home. I know it may come in handy for me in few years when I become a grandfather ha-ha. I have seen videos where the owners were taking pride in showing of babies roughing up their puppies and the latter were staying calm. But any dog lover could tell from the body posturing of the dog that anything could have gone wrong.